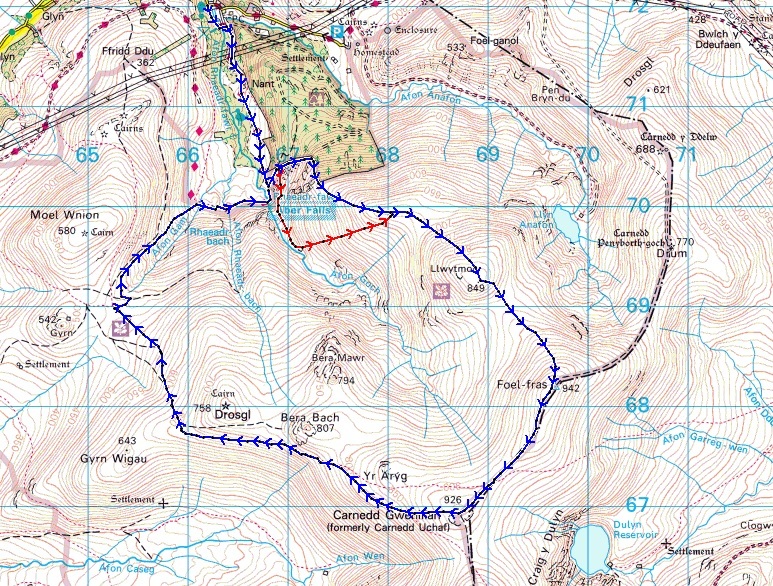 The original plan in March was to approach Foel Fras from Aber Falls, then to swing southwest to Carnedd Gwenllian. 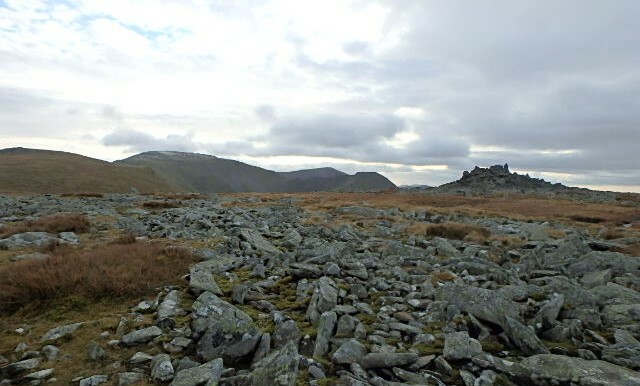 Instead I had run out of time after a minor epic on the ‘greasy slab’ above Aber and snowdrifts on Foel Fras, and at Foel Fras summit I had gone northeast to Drum to shorten the day. This time I was going to take the Gwenllian option and what’s more, I had a plan! ‘Mist’ next to the remains of the woods at Meuryn Isaf …. 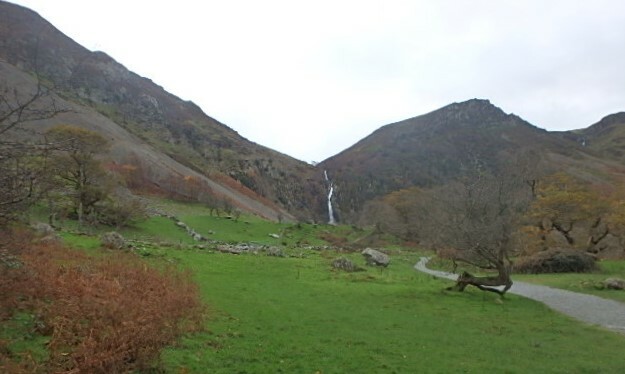 The plan was simple enough – the ‘greasy slab’ was almost certainly going to be in the same state as last time following a long, wet spell, so I would head straight for the diversion by the woods of Meuryn Isaf and Meuryn Uchaf. Arriving at the woods, I was greeted by a scene of devastation – the forest had been harvested, leaving a wasteland behind. 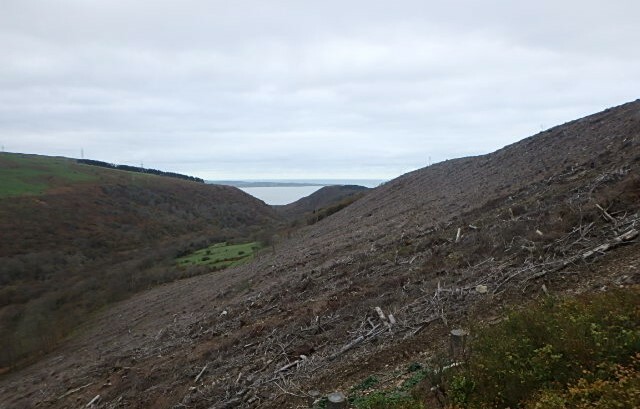 Commercial forestry isn’t always very pretty, with its straight, regimented lines, but a felled forest is worse. 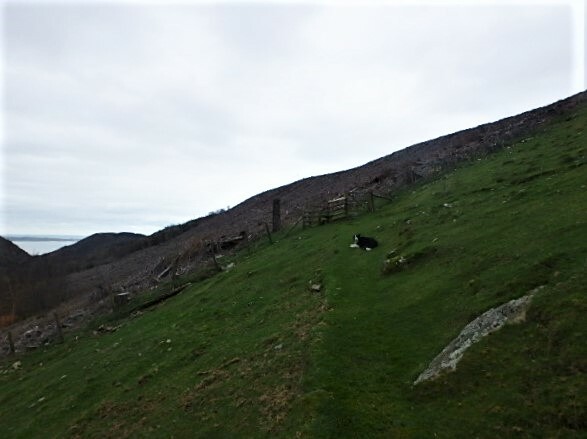 I pressed on up the slopes of Llwytmor Bach, leaving the wasteland behind me. Looking northeast I had great views across to the ‘Orsedd’ hills on the route from Drum down to Aber, but soon my view was restricted to the grassy mound of Llwytmor Bach. 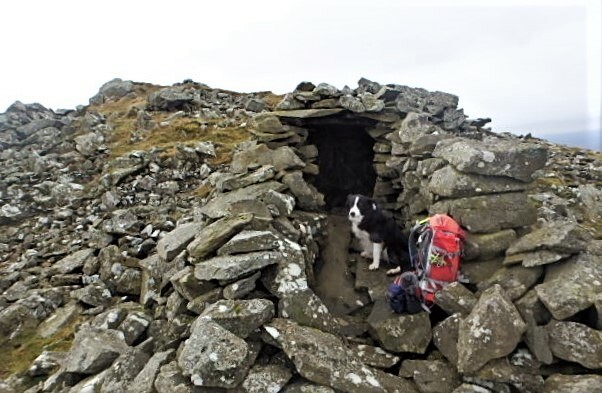 There is a tiny stone shelter at the summit, which seemed as good a place for a lunch break – Border Collie ‘Mist’ was in full agreement, and did a good job of mugging me for my sandwiches. 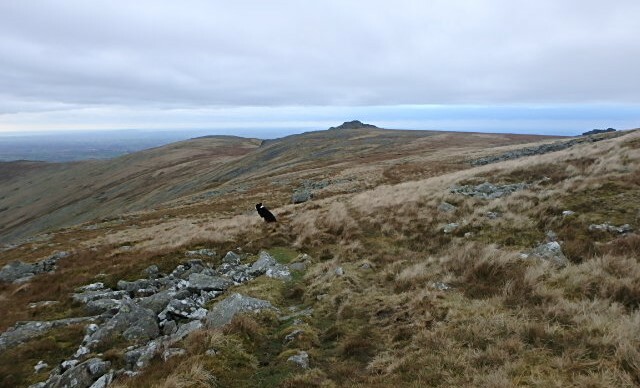 From Llwytmor Bach (690 metres) I started on a long slog up Llwytmor (849 metres) and Foel Fras (942 metres) with a loss of height of seventy metres between them. Last March the walking had been made more arduous by snowdrifts. 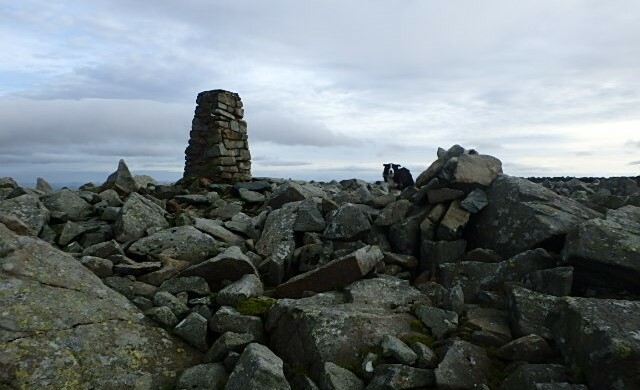 This time the ground was waterlogged, on top of which I was recovering from a heavy cold, and the summit of Foel Fras was a very welcome sight when I finally arrived at the trig point. From Foel Fras the route was effectively downhill, apart from the occasional cheeky bit of ascent. 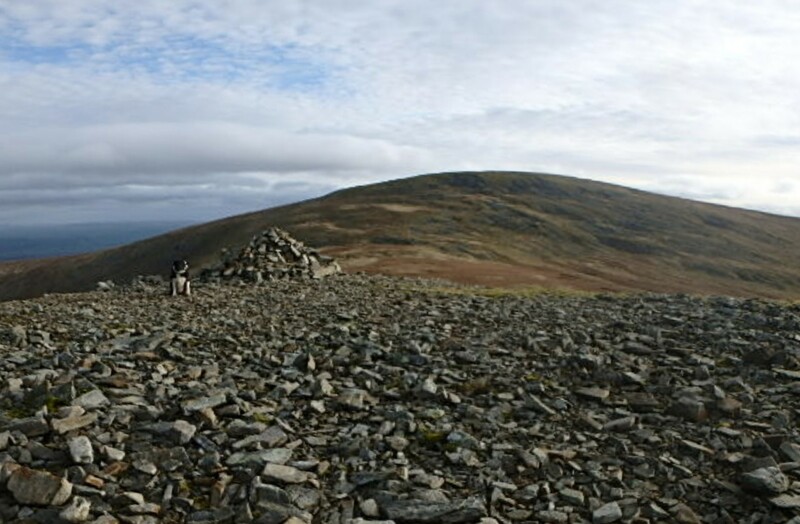 First on the list was a descent to Carnedd Gwenllian, previously known as Carnedd Uchaf (High Cairn) but now renamed after Gwenllian of Wales, the daughter of Llywelyn ap Gruffudd, the last native Welsh ‘Prince of Wales’. 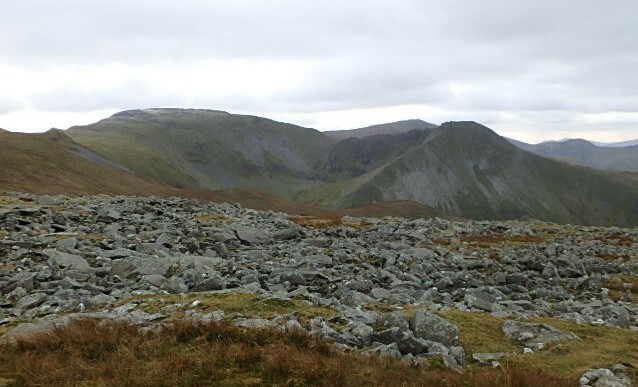 Rising in the distance was Carnedd Llewelyn, the highest peak of the Carneddau, with its satellite peak of Yr Elen, but for me it was time to head west. 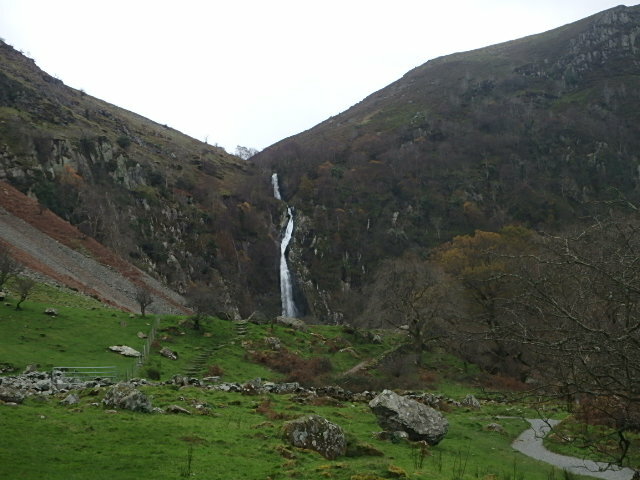 Passing below Bera Bach …. 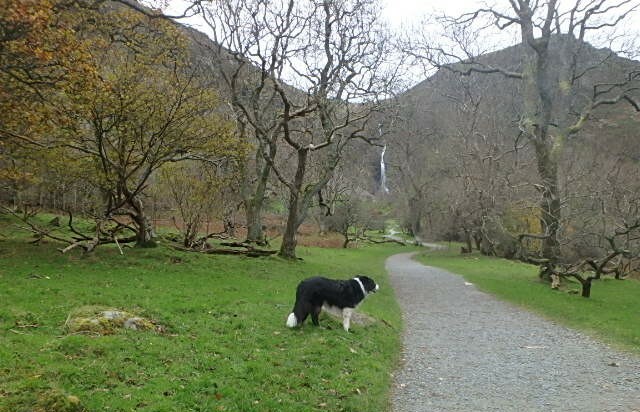 The path below Bera Bach and Drosgl was a good navigational handrail, allowing good progress. 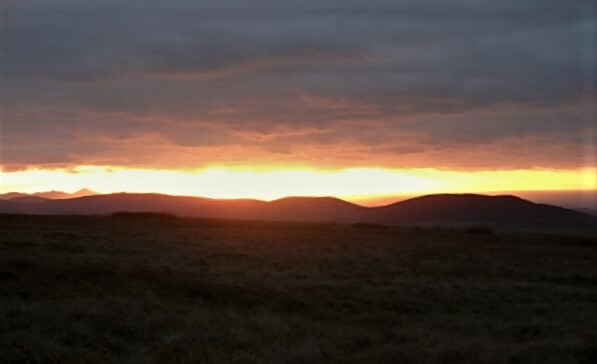 Not that I was in any rush – I had started late in the morning to tackle an 18-km route, so it wasn’t a question of would it get dark before I finished the route, but when would it get dark. Fortunately, this was also part of the plan – my missus hates walking in the dark (I think she likes to be able to see what she is about to fall off!) but I love it. 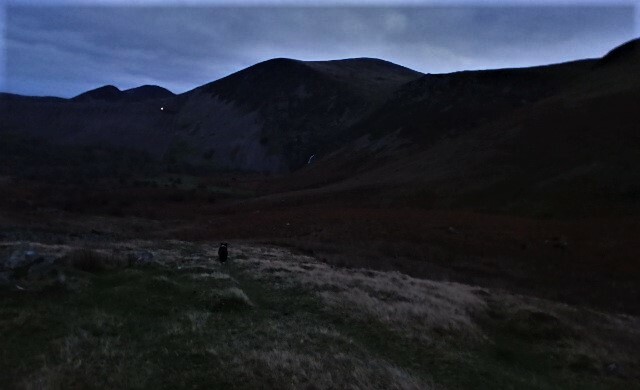 Sure enough, after passing Drosgl the sun dipped down behind the mountains of the Glyderau, and as I turned the corner to head back to Aber Falls, the darkness took over. 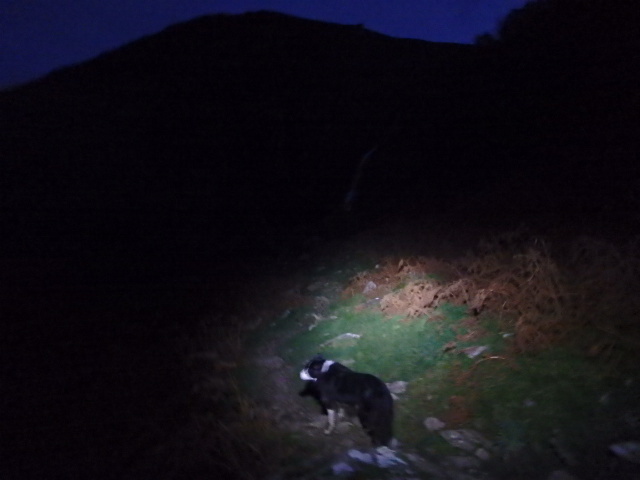 For me, walking in the dark is a real pleasure, giving a different dimension on being out in the mountains – the only dimension that ‘Mist’ was interested in by now was a round dish containing her dinner! p.s. At the start of the walk I had a fumbly moment trying to turn off the automatic flash on my camera – in doing so I also managed to turn down the resolution of the images to a measly 640 x 480, which is why the pics are not particularly sharp. It was a pity I only realised this when I got home! An excellent account, Paul (and mist). 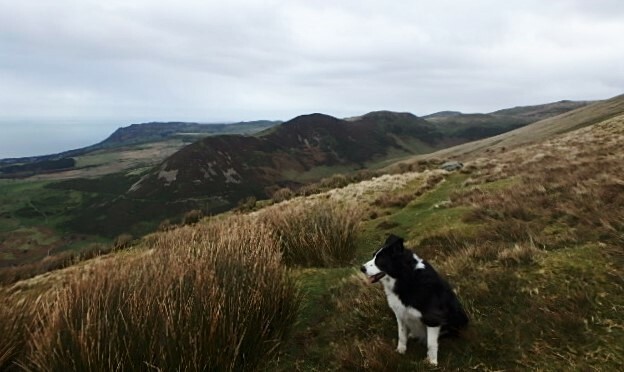 Whetted my appetite for a trip to the Welsh mountains. Seemed a bit arduous at times though. 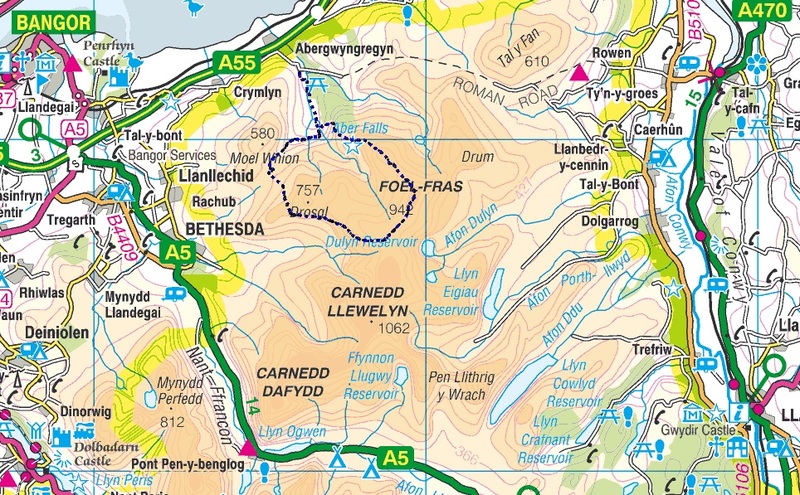 Cheers Bernie – you’re spot on about Foel Fras being arduous at times, it seems to go on forever! 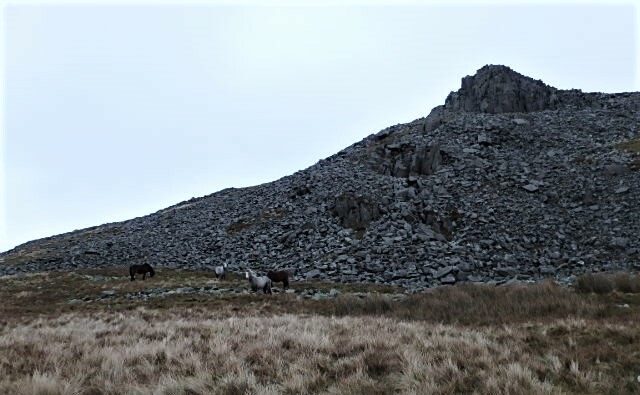 The first time I was up there from Aber was with your John – we had much better weather and conditions so we didn’t notice the height gain as much. Walking in the dark gives me a feeling of having squeezed the last drop out of the day. 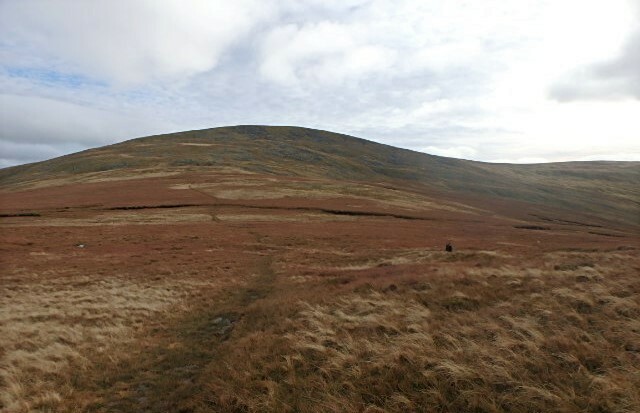 Foel Fras just looks like a hill from many places, but its actually a very big hill. so not to be underestimated.